If you always order the mixed-grill fajitas, it's time to get your surf 'n turf on at home! 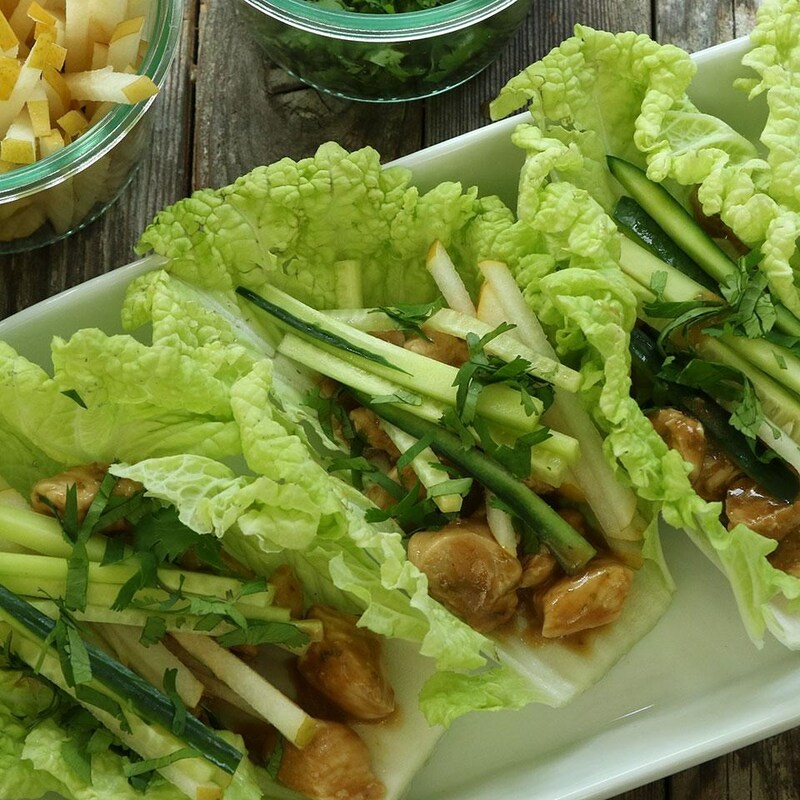 * Forget taco salad; a serving of this fajita mix makes an awesome topper for your greens. Instead of dressing, try salsa! * For a morning fix, toss in a skillet with egg whites or fat-free egg substitute. Fajita scramble! Heat oil in large skillet on medium-high heat. Add shrimp; cook and stir 2 minutes or just until shrimp turn pink. Remove shrimp from skillet. Set aside. Stir vegetables into skillet. Cook and stir 4 minutes or until tender-crisp. Return shrimp to skillet. Add marinade and pineapple chunks; cook and stir 2 minutes or until heated through. Serve over cooked cauliflower rice. Lightly spray 10x13-inch baking pan with olive oil spray. Season the chicken with lemon pepper; place in the baking dish. Loosely cover with foil and bake until the chicken is no longer pink inside, anywhere from 30 to 45 minutes depending upon the size of the chicken breasts. If you think your grill is only for cooking the main entrée, hot dogs, or burgers, think again. During summer, we all love eating fresh, seasonal fruit for a tasty snack or dessert. But, have you ever tried eating grilled fruit, particularly when tossed into a crisp summer salad? Whether you enjoy it in a sweet or savory dish, fruit is a welcomed treat that is made all the more delicious thanks to the grill. Nature’s sweetest delicacy and Georgia staple is slightly charred and tossed with baby arugula, feta cheese, mint leaves, chopped pistachios, and vinaigrette to make a refreshing appetizer or side dish paired with grilled meats. Fortunately, cooking a meal on the grill is super easy, even if you’re not a grill master. Don’t believe us? You’ll be pleased to learn this recipe comes together in just 25 minutes. Traditional, firm ripe peaches work best in this dish. Place peaches, cut sides down, on the grill for about 4 minutes, or until well charred. The smoky flavor marries perfectly with the natural sweetness of peaches to deliver a delicious caramelized crunch. Next, toss together arugula, feta, mint, and toasted pistachios in a large bowl. Whisk together ingredients to make the oil and vinegar-based dressing, and serve grilled peaches over salad. Your summer backyard bash just got a whole lot juicier and tastier. Preheat grill to high (450°F to 550°F). Place peaches, cut sides down, on oiled grates; grill, uncovered, until well charred, about 4 minutes, turning to grill on all sides. Toss together arugula, feta, mint, and pistachios in a large bowl. Whisk together olive oil, vinegar, lemon juice, mustard, honey, salt, and pepper in a medium bowl until well combined. Drizzle vinaigrette over arugula; toss to combine. Serve grilled peaches over salad. 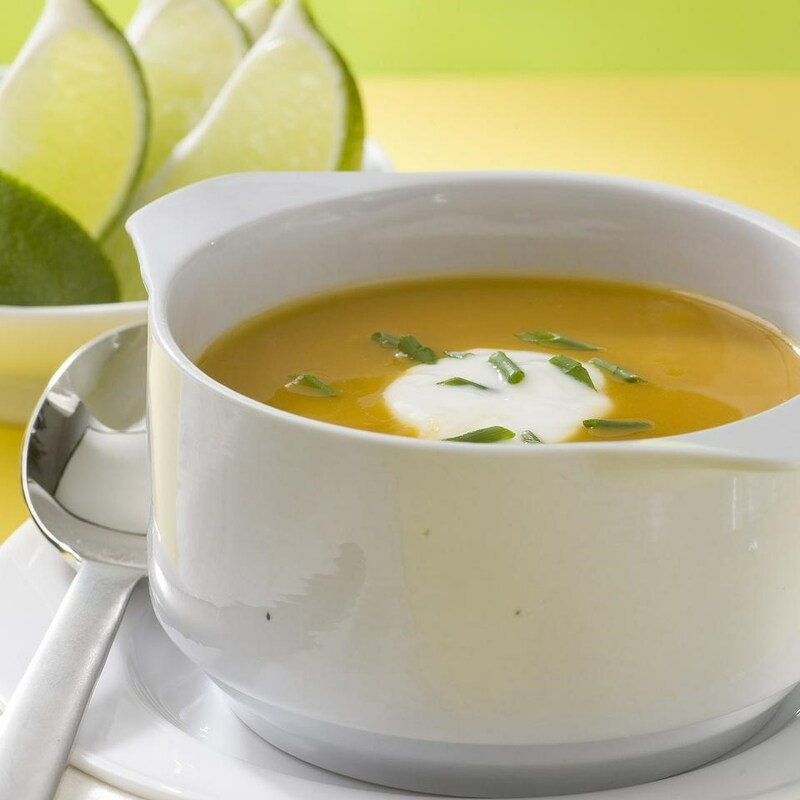 This silky-smooth butternut soup gets a hit of spice from chipotle, cloves and cumin. 1 1/2 pounds (1 small to medium) butternut or other winter squash. This can be purchased precut. If using whole squash, cut squash in half and seed. Place the halves on a baking sheet, cut-side down. Bake until tender when pierced with a knife, 45 minutes to 1 hour. Scoop out flesh when cool enough to handle. If using precut squash, simply simmer in water until tender. Heat oil in a large saucepan over medium heat. Add celery, onion and carrot and stir to coat. Cover, reduce heat to medium-low and cook, stirring frequently, until soft, 8 to 10 minutes. Stir in the squash flesh, cumin, chipotle to taste and cloves. Add broth and simmer, covered, until the vegetables are very tender, 20 to 25 minutes. Puree the soup with an immersion blender or a regular blender (in batches) until smooth. (Use caution when pureeing hot liquids.) Season with salt and pepper. Garnish with a drizzle of yogurt and sprinkle of chives (or parsley). Make Ahead Tip: Cover and refrigerate the soup for up to 3 days.